Recently I received the following two sets of mini board books from Kane Miller, which is connected to Usborne Books and More. Small and compact, there are four books within each set which are perfect for little hands. (They are also perfect to stuff away in backpacks for perusal during church or when sitting in waiting rooms or while driving in the car.) Small and concise, (the books are 3 3/4 " x 3 3/4"), they make for easy reading and are very entertaining to the young fry. 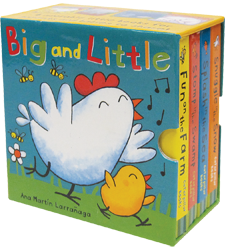 In the Big and Little Set by Ana Martin Larranaga we find four mini books about animals: Splash in the Sea, Stomp in the Swamp, Fun on the Farm and Snuggle in the Snow. Each story focuses on an animal baby and its parent and is a warm and snuggly read, full of love and fuzzy warmth. Naturally these books were a hit around here seeing that they dealt with our favorite subject matter - animals! The illustrations (also by Larranaga) are bright and bold. If you look at a picture here on your left of the box that holds the four titles, you can get a feel for the style of the books. Very cute, very fun and exciting - especially if you are a toddler. 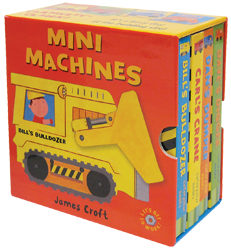 Mini Machines is another box set - this one by James Croft. The books are also small in size and deal with another well-loved subject (by Bookworm2, age 2) - construction trucks! We found this particular set somewhat more appealing because the books are all interconnected, sharing the story of the same characters. We learned about Bill's Bulldozer, Dave's Digger, Dan's Dump Truck and Carl's Crane. Bill, Dave, Dan and Carl all work on the same construction site though so you may see them interspersed throughout the books. It adds a certain continuity to the subject matter and was very much enjoyed. If you have a little boy who is just old enough to start being interested in construction trucks - this is a very fun set! Both Big and Little and Mini Machines are both listed on Amazon but I should point out to you that they are actually not available through Amazon. If you are interested in them, follow the links provided to Usborne Books & More where you can obtain copies. In the meantime, I am happy and delighted to tell you that Kane Miller has offered one copy of each of the above series to one Reading to Know reader. Interested? Simply leave a comment below! This contest will be open through Tuesday, February 1st and is open to U.S. Residents only. Thank you, Kane Miller, for sending us these copies to check out and for your generosity to one of my readers! THIS CONTEST IS NOW CLOSED. THE WINNER (as selected by random.org) IS #13 - STEPHANIE'S MOMMY BRAIN. CONGRATULATIONS! I would love to be entered. Especially the animal ones look like something that could help with my son's speech. These books look sooo cute! Please enter me in the contest! We really need to add to our TRUCK collection, though both book sets look wonderful. Usborne tends to have great books. Yes Please! I have two little godsons (one is 10 months old and one is 4 months old) and I just love to read to them to instill a love of books! I'd love to give these to them! These would be perfect for my two youngest. We have reached the point we are having to replaced well loved books for little hands. Count me in...the first set looks super cute! How very fun! Thanks for the opportunity! Thanks so much for hosting this! I would love to be entered. My 2.5 YO niece just loves books and I am more than happy to feed her habit! We love pint sized books at our house. I keep a few tucked in the diaper bag at all times. You just never know when you'll need something to occupy little hands and minds. Oooh, my classroom would love this set of books!